We recognise and understand that our commercial customers and stakeholders need access to driving licence information in different formats, to enable them to meet their own personal or business needs. Our new Share Driving Licence service puts the driving licence holder firmly in control of their own driving record and who they share their driving licence information with. Many of our commercial customers and stakeholders are required to carry out appropriate checks in accordance with their own corporate policies, so require instant access to driving licence information in order to meet their statutory obligations. Whether stakeholders are provided with a check code to redeem from the driver or require access via an alternative service, we have a number of different channels available. For more information on driving licence changes please visit our campaign page. The licence holder should have a password, my employer is checking by pretending to be the holder, because he has NI number post code and driver number. We're satisfied that the authentication process is proportionate having taken into account the level and type of information that is provided via the View Driving Licence service. The credentials used to authenticate the identity of the user are considered consistent with Level 2 of the current requirements for the secure delivery of online public services. Has anyone else has issues retrieving their record? I've found the service to be very temperamental. I asked family members to try it and they too also ran into issues. Sometimes it works and sometimes it doesn't. The error messages are also inconsistent. For example, the error either comes up as "check your details", other times the error mentions that no record can be found, and then other times it works fine. Hi Adam, thanks for getting in touch. The majority of users have been able to access their records without any issues. Some may receive the ‘check you’ve entered your details correctly’ message where those entered do not match what the information recorded on the driving licence. The messaging for each driver should be consistent providing that the same information was entered on each occasion. 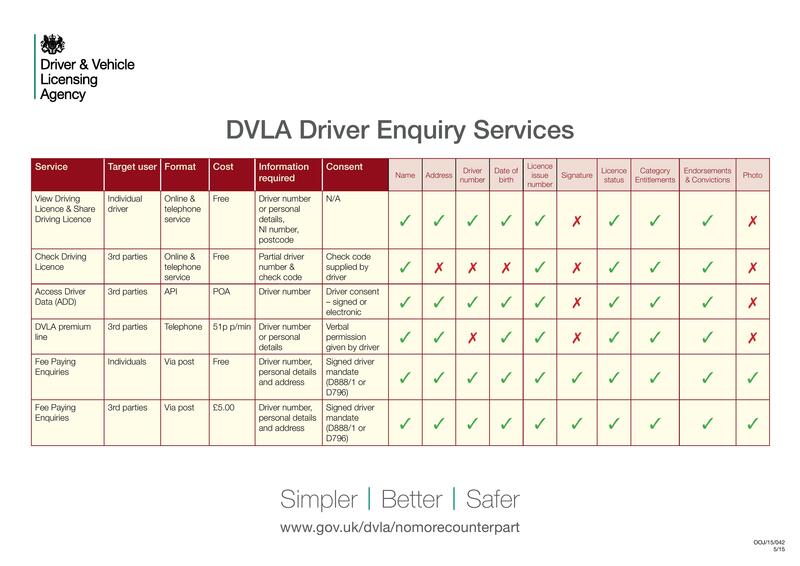 If you would like to email your driving licence number to abolitionofcounterpart@dvla.gsi.gov.uk we'll look into the issues you've experienced.